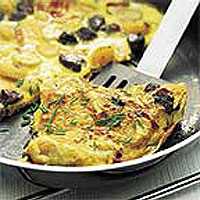 Ideal for breakfast, but good enough to eat at any time of the day, this omelette is quick and easy to prepare and is packed with flavour. It is a great way to use up leftover cold potatoes. Heat a medium-sized non-stick frying pan over a medium heat, add the lardons and dry fry for 1 minute, or until just starting to turn golden. Add the potatoes and fry for 4-5 minutes until golden, then add the black pudding and fry for a further 2-3 minutes, stirring occasionally. Reduce the heat and pour in the eggs. Cook for 3-4 minutes, or until the omelette is firm around the edges. Increase the heat to its highest setting and cook for a further minute to brown the underside. Cut the omelette in half and fold each half in half again. Garnish with snipped chives and serve immediately with salad leaves, crusty white bread and a dash of Tabasco sauce or tomato ketchup to taste. Use cooked and chopped sausages as an alternative to black pudding.